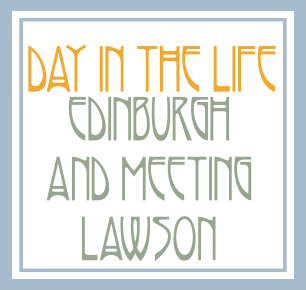 A Day In The Life Of Erin || Edinburgh + Meeting Lawson! Whoever you are, if you're reading this, you may not have heard of them, as they are still quite small in the UK, although, they do have an album out, called Chapman Square (which is awesome and you should definitely buy it by the way), but i've been supporting them for around two and a half years, since before they were signed to a record label. The weather was absolutely beautiful, but we got there five hours in advance (I have no idea why we thought we needed five hours, but yeah..) and sitting on the main street, in direct sunlight, when it's 30 degrees Celsius outside, is not fun. I had such a sore head from the heat, and I spent so much money on cold drinks, because I finished what I brought so quickly. My friend even bought an umbrella, to try and shield us from the sun (which wasn't entirely successful just to let you know). Everyone in the queue was sweating, everyone's makeup had melted off their faces, we were all red in the face, and tired, and fed up.. it must have been some sight for the many passers by! It was a pretty horrible 5 hours.. However, when we got let in, it was well worth it! We got to meet them, and got photos with them (I look horrific in them but oops) , and of course, they signed our CD's. They were lovely! (Like they always are, when we meet them). After meeting them, the three of us headed down to a nearby park, to which we could see Edinburgh Castle. it was lovely, and relaxing, just to sit and chat under a tree, in the sun for a while, before we headed home. So, let me know, did you like this kind of post? I think it was more personal, and you can see what i get up to in my (usually) boring life! Also, you can buy Lawson's single on UK itunes HERE. Go on, download it, you won't regret it! It features American rapper B.o.B, and I usually hate rap music, but it's just brilliant! thanks for reading, love you lots! aw thanks, yeah, it was brilliant:)!